As Platinum Sponsor of Edinburgh University Formula Student, we were delighted when the University of Edinburgh team recently took first place at the Formula Student – Artificial Intelligence (FS-AI) 2018. This was the UK’s first autonomous race car contest. For their performance across both static and dynamic tests, the team was awarded best in class, fending off competition from around the world. Competing at Formula Student, the world’s largest educational engineering contest, a multidisciplinary team of more than 50 members from University of Edinburgh, joined over 3,000 other students at Silverstone in England for the annual contest. Formula Student challenges university teams from around the world to each design, build and race a single-seat race car. 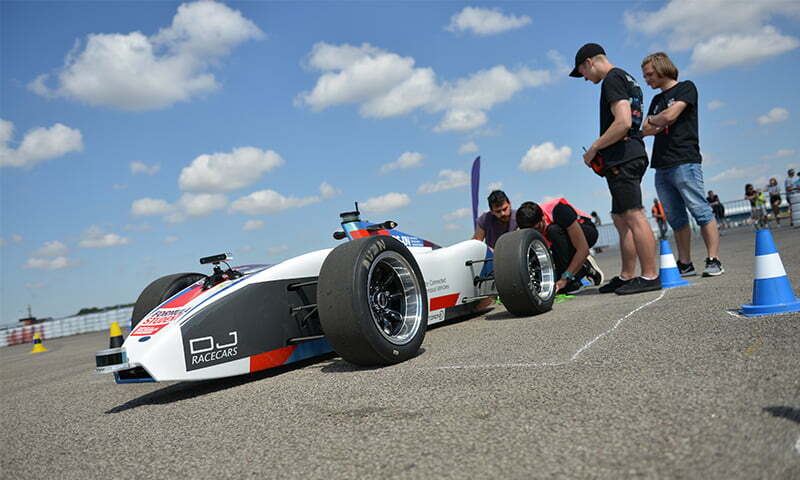 This year an additional competition, Formula Student – Artificial Intelligence (FS-AI), was added, tasking students with developing AI software for a driverless race car. We are sponsoring the autonomous team at Edinburgh University Formula Student. As well as providing regular mentoring and technical support, we also supplied the team with crucial hardware for their driverless race car challenge bid. Included was the loan of a Velodyne VLP-16 PUCK™, a 360° horizontal field-of-view LiDAR sensor with a 100m range, 16 laser channels and up to 600,000 points per second. This sensor was installed on a self-driving car provided by the contest organisers, the Institution of Mechanical Engineers (IMechE). As the UK distributor for Velodyne, we deliver LiDAR-based sensors and system integration for Jaguar Land Rover, Renault, Oxbotica and other vehicle manufacturers working in the field of automation. We have also pioneered the application of LiDAR in 3D mapping solutions specifically for use on drones, under our Routescene brand. Edinburgh University Formula Student developed the software stack for the driverless car over two semesters, and between their regular studies. A first round data collection lap was carried out before the car embarked on its maiden, fully autonomous circuit the following day as part of the ‘dynamic events’ aspect of the challenge. Despite the car itself only being unveiled the week of the event and the Edinburgh team having only three days to familiarise themselves with the vehicle, they completed a full lap of the custom designed ‘Track Drive’ circuit. In addition to this, a trio of ‘static events’ tested the team’s commercial skills and knowledge. These included a design presentation, a business presentation and an overview of real-world autonomous vehicles. Competing in all three events, Edinburgh University Formula Student scored the most points in the ‘Dynamic Driver Test’ (software-only) class. For their performance across both static and dynamic tests, the team was awarded best in class, fending off competition from around the world. Having solidified the leading position at the UK’s first-ever driverless race car competition, they are already looking ahead to sustain it next year. Gert Riemersma, CEO of Mapix technologies Ltd, said: “This is a huge achievement for Edinburgh University Formula Student. The contest is a fantastic and proven conduit for students looking to begin careers in the automotive industry. Now, with more and more manufacturers harnessing the potential of autonomous technology, having an element of the contest dedicated to driverless software has massive relevance. Formula Student (FS) is Europe’s most established educational engineering competition and is organised by the Institution of Mechanical Engineers. Backed by industry and high-profile engineers such Patron, Ross Brawn OBE, the competition aims to develop enterprising and innovative young engineers and encourage more young people to take up a career in engineering.